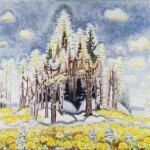 After a detour into social realism, Charles Burchfield returned to his first love, landscape painting, but with new techniques that let the viewer partake of the artist’s mystical, multi-sensory experience. Charles Burchfield, View From Our Front Porch at Salem, Ohio, May 23, 1917, watercolor, gouache and graphite on paper, 22 x 20. Charles Burchfield first gained footing in the art world with austere scenes of American life. Though he never quite considered himself a Regionalist painter, the renderings of small-town vistas and industrial scenes that he began painting in 1920 garnered him critical acclaim and public renown. Yet in April 1930, when the newly established Museum of Modern Art in New York made Burchfield the subject of its first-ever solo exhibition, 27 poetic watercolor landscapes painted over a decade earlier graced the museum walls. The exhibition, titled “Charles Burchfield: Early Watercolors 1916–1918,” featured works such as Church Bells Ringing, Rainy Winter Night, a watercolor and gouache over graphite piece completed in 1917—an astoundingly prolific year for the artist, during which he created over 200 paintings. This piece, like the others in the show, focused on the drama and energy of the natural world rather than on the starkness of the manmade and inhabited. Critics took notice of the schism between the two bodies of work. One writer for Town and Country described seeing the early work as a “shock and a delight,” adding that it put forth the “fantasies of a mind turned from reality.” The same critic described the tone of Burchfield’s more recent pieces as “pitiless” in their realism. Alfred Barr, the director of the museum, had been shown the early work by New York gallery owner Frank Rehn. The dealer, who began representing the artist around that time and would for some years, had seen the body of work after Edward Wales Root, a collector and scholar of contemporary American art, spotted it when visiting Burchfield at his studio in 1929. Barr portrayed Burchfield rather incorrectly as an overnight discovery, writing in his forward to the exhibition, “We can only conclude that we have in this period of Burchfield’s development one of the most isolated and original phenomena in American art.” Hyperbole aside, there did seem to be a striking difference between the early, expressionist, more fanciful work and the newer, moodier, more representational fare. The more “stylized” works seen at the Museum of Modern Art had been created primarily after Burchfield had graduated from the Cleveland School of Art in 1916 and returned to his hometown, Salem, Ohio (he later moved to Buffalo, N.Y., in 1921). Inspired by nature writers like Henry David Thoreau and John Burroughs, he began keeping extensive journals of his nature observations when he was 16. This habit had an enormous impact on his painting. His canny sense of examination coupled with his comfort within the sylvan landscape made nature a natural subject for the artist. He was preoccupied with nature’s unfolding narrative—from day to night, from one season to another, or through different weather patterns—which prompted him to embark on “all day sketches” in which he attempted to render all of the changes he observed in a landscape in one day. Nineteen-seventeen’s outpouring of creativity eventually led the artist to a stopping point. A desire to deal with more somber subject matter coincided with his service in the Army at Camp Jackson, S.C., in 1918, and later his reading of the recently published short story cycle Winesburg, Ohio by Sherwood Anderson. The book, which peers under the banal, isolating rock of small-town life, struck a chord with Burchfield. The artist wrote that he wanted to “show the hardness of human lives and struggles.” He turned his focus to small-town and industrial scenes. He relished painting houses. Burchfield’s realist depictions of houses, which hint at the unknown lives being led inside, are like Anderson’s characters, who conceal their inner thoughts behind a social façade. Henry McBride, a supporter of contemporary art in New York, twigged on to Burchfield’s work through the show. Impressed by the paintings, he nevertheless believed them to be critical representations of Burchfield’s home, the “loathsome town of Salem, Ohio.” McBride claimed that “his pictures grew out of his detestation of the place.” Burchfield, much like contemporaries such as Edward Hopper, Reginald Marsh, and Thomas Hart Benton, was capturing middle-class life with a penetrating honesty. These paintings are concerned with character, not criticism. During the 1920s Burchfield relocated to Buffalo, N.Y., to work for M. H. Birge & Sons Company, where he became a designer of wallpaper. He married and had five children and continued painting in what was considered a Regionalist style. He showed his work internationally in London and Paris, and near home in Buffalo and New York. Though he has been regarded as an outsider with regard to the art world at large, in truth he entered the contemporary art world, sold paintings and gained recognition. His show at the Museum of Modern Art expanded his popularity and established him as a painter with range. The Whitney Museum was gifted Noontime in Late May by Gertrude Vanderbilt in 1931. The Museum of Modern Art added six of Burchfield’s early paintings to its permanent collection when Abby Aldrich Rockefeller donated them in 1935 and 1936. He was profiled in Life magazine in 1936 and juried shows for the New York World’s Fair in 1939, for the Met in 1942, and for the Solomon R. Guggenheim Foundation for many years. 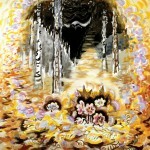 In 1943 Burchfield entered into what is considered his third and final period. Worried that he might be diving too deeply into realism, he slowly turned away from his industrial and small-town scenes. He went back to nature—both in subject matter and mindset. 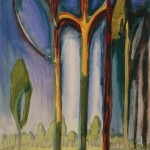 He began to revisit his pre-1920s paintings, adding to and improving them. 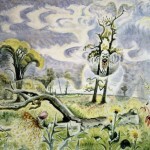 A new exhibition at the Brandywine River Museum in Chadds Ford, Pa. (running August 23 through November 16), co-organized with the Burchfield Penney Art Center in Buffalo (it will travel there and be on view from December 12 through February 22, 2015), focuses on Burchfield’s first and last periods—and the blending of the two. Showcasing over 50 paintings from important American collections, the exhibition gives the viewer the opportunity to see—and almost hear and smell—the scenes that Burchfield recalled from nature. In her essay “Burchfield’s Nature: Surveying the Landscape,” Audrey Lewis, associate curator at the Brandywine River Museum, writes, “From 1943 onward, Burchfield painted with a renewed vigor and spirit, infusing his landscapes with fantasy and spontaneity. This moment would prove to be pivotal for Burchfield and American art.” Nighthawks at Twilight, painted initially in 1917, was revised by the artist in 1949. He enlarged the painting to 34 ½ x 48 ½ inches. In the painting’s foreground is a dead, gnarled tree and various grasses leaning as if swept by the wind. The background is framed by thick rows of evergreens alive with movement. The gray sky suggests that nightfall is descending on the landscape, while the nighthawks flying above the trees seem fit for an auger’s work. Burchfield details the tops of the trees and clouds in the sky with expressionist flicks of lines and dots, which aid in giving the impression that anything in the painting could change at a moment’s notice—the time of day, the weather, the season. In fact, it might not be surprising if the trees began a gloomy song and dance number. Summer Afternoon, another painting in the exhibition, was painted by Burchfield in 1917 and taken up again in 1948. It is a prime example of the artist’s application of noise in his paintings. Using abstracted lines and squiggles similar to those in Nighthawks and many other paintings, Burchfield could make shrubbery appear to be buzzing with insect activity or a tree’s leaves “whoosh” in the wind. Many of his suns’ rays seem to be emitting the familiar sound of summer heat. Summer Afternoon, which was expanded from 22 x 18 inches to 47 x 41 ½ inches, has a dragonfly in its foreground, hovering above a creek. The dragonfly’s wings appear to be beating vigorously, and the vibrations of their hard work seem palpable. 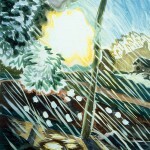 In a sense, Burchfield’s techniques bring to mind the devices used by cartoonists—curlicues of “smell” wafting over a pie or lines of “noise” emanating from musical instruments—simple signals to maximize experiential effect. In watercolor, Burchfield makes these techniques seem transcendent, almost mystical. He isn’t just showing the scene but rather letting the viewer feel what he felt when he was there. Throughout the 1960s Burchfield remained prolific, in part because of the demand for new work from collectors and critics, but also because of his desire to continue to articulate scenes from nature. In Afternoon Wind (1964), Burchfield employs purple, yellow, and gray streaks to give personality to pleasant gusts. Bee Hepaticas (or The Fragrance of Spring) is a watercolor, charcoal, and chalk work from around 1962. It depicts bee hepaticas—the artist’s favorite flower—emerging in a sort of golden ring, surrounding a darkened circle of birch trees. The scene is more abstracted than many of Burchfield’s other paintings, and suggests a sharp dichotomy between a beleaguered winter landscape and emerging spring. 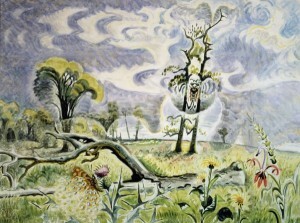 Early Spring, a watercolor and charcoal on paper that Burchfield worked on in 1966 and 1967, was still on his easel at the time of his death in 1967. A grove of trees, which are beginning to sprout leaves again, and a crop of yellow flowers poke through the snow. The landscape, like Burchfield’s work itself, is striving for change.